Five U.S. homeowner lawsuits over the performance of a deck coating have been merged into multidistrict litigation in federal court in Chicago. The homeowners, from five different states, are seeking class-action status for their case against Rust-Oleum Corp., a division of RPM International Inc.
A sixth lawsuit was underway in Illinois but was merged in November with another complaint, court papers say. Sullivan et al v Rust-Oleum Corp. et al. 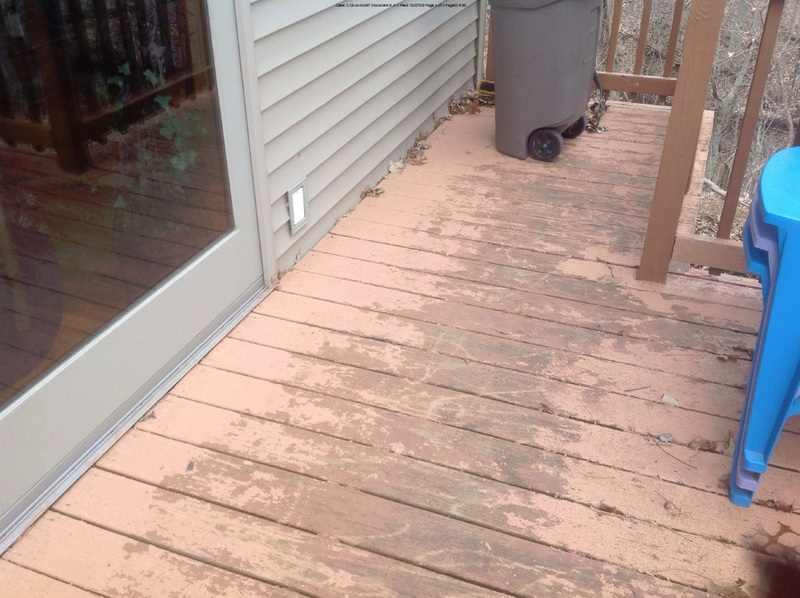 David and Kathleen Sullivan submitted these photos of their deck and porch as part of their lawsuit against Rust-Oleum. The couple's action is one of several alleging premature failure of Rust-Oleum Restore. Rust-Oleum has said it "takes its customers' satisfaction and the quality of its products very seriously," but has declined to comment on the litigation. For now, the fight over Rust-Oleum’s Deck & Concrete Restore product has been centralized in the Vernon Hills, IL-based company's back yard: the Northern District of Illinois. The case Transfer Order was sought by Rust-Oleum, without objection from the homeowners. All of the suits are similar, alleging that the deck and concrete resurfacing products sold under the Restore brand "are defective because they allegedly bubble, flake, chip, peel, or otherwise degrade prematurely, contrary to the representations in defendant’s marketing, labeling, and product warranty," the order said. 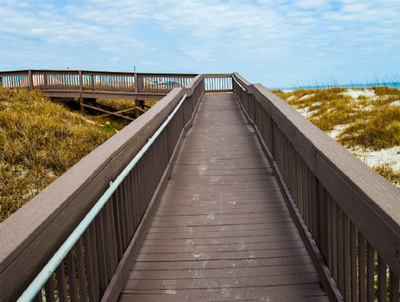 Rust-Oleum Corp.'s Deck & Concrete Restore was introduced in May 2013. "Additionally," the order noted, "all actions are on behalf of overlapping putative nationwide and statewide classes of Restore consumers." The plaintiffs are seeking more than $5 million in compensatory and punitive damages. 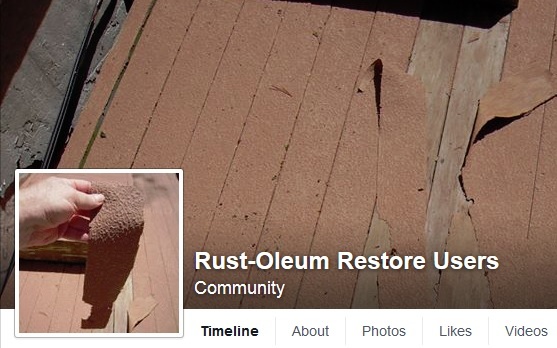 A Facebook group, Rust-Oleum Restore Users, has added fuel to the fire. Court documents do not indicate how many Restore purchasers could potentially be affected by the case. The October 2014 class-action complaint by Steve and Gina Cady, Scott Reinhart and John Riello of Pennsylvania is typical. Disgruntled customers of Rust-Oleum Restore vented last year on Facebook, drawing 61 Likes. Deck & Concrete Restore, a pre-mixed, water-based acrylic coating, was introduced in May 2013. Rust-Oleum describe the products as "liquid-armor resurfacers" that "offer a high-performance, low-maintenance, long-lasting alternative to the endless cycle of repairing and repainting." Rust-Oleum says the paints are 10 times thicker than other paints; the products carried a lifetime warranty. Persuaded by in-store product reps and advertising, the plaintiffs say, they purchased Restore in July and August 2013 for their home decks in Pennsylvania and New Jersey. The product failed within a year, they say. "Unfortunately," the suit says, "the common failures with Restore paint require replacement far sooner than consumers reasonably expect." In fact, it alleges, Rust-Oleum's "design and materials choices" for Restore "have created a product that begins to fail on its first day of use, even if perfectly used in its intended environment." The complaint says Restore products "contain serious design and manufacturing defects, making them susceptible to separating, cracking, bubbling, flaking, chipping and general degradation after application." Plaintiffs said they found Rust-Oleum's ads, in-store reps, product claims and lifetime warranty persuasive. The plaintiffs allege a host of wrongs, including deceptive trade practics, negligence, breach of warranty, unjust enrichment and more. Restore's lifetime warranty promised "complete satisfaction with the performance of this product for as long as you own or reside in your home when the product has been applied according to the directions provided," the Pennsylvania suit says, quoting the manufacturer. However, Rust-Oleum has "failed to fully honor" its warranties and "failed to compensate" the plaintiffs, they say. 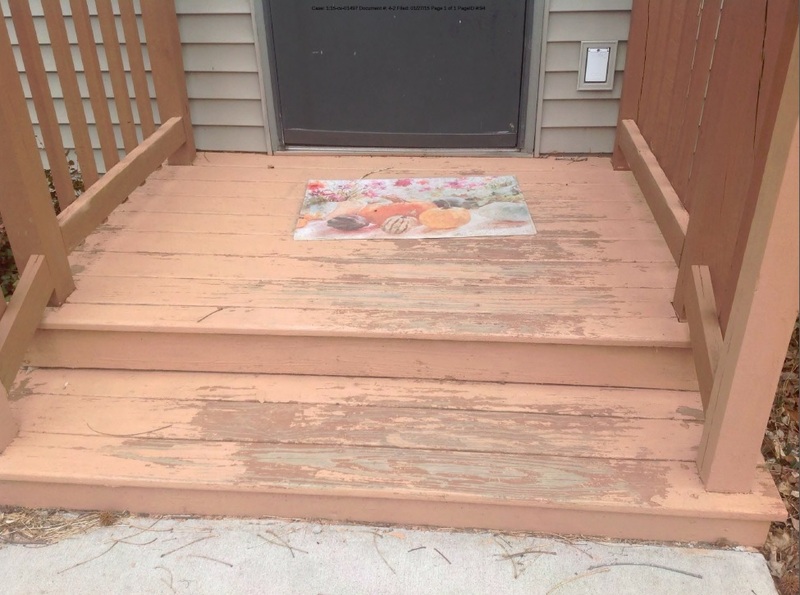 Rust-Oleum refunded two of the homeowners' purchase price for the product but did not compensate them for the "damage and deterioration" to their deck, the plaintiffs say. Removing the product is "a labor-intensive, expensive process," the plaintiffs say. The paint contains crystalline silica, which requires precautions when sanding or abrading. The homeowners thus want Rust-Oleum to pay for removing and replacing its product from "the homes, offices, buildings and other structures" of members of the proposed class. paint manufactures sometimes have to take the good with the bad by not having a paint inspector check the substrates before coating...your average home owner isn't a professional painter...it could have rained a couple days before and the wood decks were still damp...your going to have problems with adhesion,like in the pictures shown.. I agree with the plaintiff's. I also used Rustoleum's Restore and it failed quickly. It did not live up to the manufacture's claims. Surface prep is critical with high build elastomeric coatings. Elastomeric coatings have high cohesion, and will peel apart a failing substrate. The underside of the coating needs to be inspected for the presence of old paint or wood fibers. Also, wood decks are only painted on the top. The bottom and edges are fully exposed to water vapor, leading to a significant vapor drive when heated in the sun. They oversold the product. Decks are troublesome. Even professionals get less-than-perfect results. i can't imagine a consumer product that promises complete satisfaction. reminds me of the above ground pool that i bought the family years ago "9 easy steps" was their claim. right. It's always easy to blame the coating manufacturer for the performance of the product when in fact peeling issues are almost always a result of poor surface preparation and failure to follow the manufacturer's recommendations. Regardless of how good the product is, it will not compensate for a substandard surface or poor surface prep. I saw this coming at the first advertisement. Its hard enough to get people to comprehend surfaces prep for thin solid film deck paints and stains, I think I can see wood fibers in the back of the coating peeling in the Restor Users picture. Rustoleum made this sound like a cure all when it is far from it. I'm wondering how Behr's product is doing they had something like this too and I don't hear about their issues. Yes...oversold! A big company like that; going for a fast buck. Lifetime Warranty..on what? Coating mfg make wild ,unsubstantiated claims all the time. This time came back to bite them good. I wonder how many dissatisfied consumers, actually read the data sheets before applying. There is a section that explains how to test the surface for porosity by implementing a water splash test, to ensure the surface is completely porous, because if its not.....the product is not going to adhere. I have seen some of the complaints with videos attached and not one of them confirmed they had undertaken this procedure before application. Applying any coating to exterior wooden surfaces can be fraught with issues if correct procedures are not followed. An independent Testing Agency could easily prove the products performance, by applying it to the book. Even better if they took some of these failures and reapplied at no cost..to prove a point. DIY can be very tricky mine field with inexperienced Applicators. We were excited to buy Rustoleum's Restore for the two large decks on our Pennsylvania homes in June of 2013. We re-did the first deck ourselves, following instructions exactly and used 10 3-gallon cans at a cost exceeding $700. It was beautiful when done, but by the end of summer, the deck began chipping in spots. We had the second home done by professionals at a cost of $1600, and by spring of 2014, the same chipping occurred. We have receipts and pictures and would love to join with the other homeowners as part of the class action lawsuit that has been filed. I want to join this class action. My deck is a mess. Just got an estimate to replace it. It was less expensive to replace than scrape and re-stain. I tried to scrape it off my self but it was too hard to do.